India Gate stands at Rajpath near Connaught Gate, this war memorial stands to remember those souls who fell fighting for the British during World War I. The establishment of the edifice started on February 10, 1921 and it was disclosed to the citizens after 10 years that is on February 12, 1931. The 42 meter tall monument is an imitation of the ‘Arc de Triomphe’, designed by a prominent war memorial architect Edwin Lutyens. This All India War Memorial has served a concrete symbol for justice and unity amongst the citizens during the hard times. The Amar Jyoti Jawan, a memorial dedicated to deceased soldiers of the India Pakistan War was sited under the All India Memorial’s vicinity in 1971. The monument is illuminated every evening, a sure visual treat for travelers. India Gate is also beautifully characterized in the media presentations, thus increasing its visibility and popularity. Few monuments not only need no introduction but they stand for certain intangible things that are beyond aesthetic pleasures and reasoning. 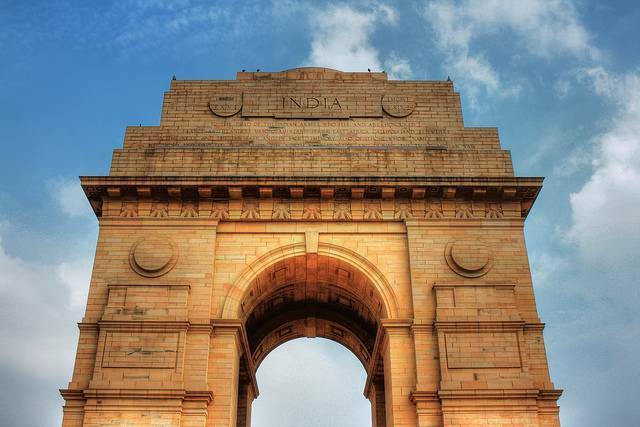 India Gate is one such iconic monument, still strong as titanium it is situated in the national capital, erected to honor the courage and sacrifice of those thousands of Indian and British soldiers who died fighting in the First World War. Come here to enjoy a pleasant summer’s evening, remember those who passed, and hope that peace prevails in the world. Evening is the best time to visit as fountains and nearby water bodies in lights present a lovely display.